Your neighborhood needs you! There are many things you can do to get involved and become more active in your community. Below are some easy ways you can connect with your neighbors and become more involved in your neighborhood. If you’re not registered yet, do it today! It’s easy and it’s free. Voting is the best and most effective way you can change policies in your community. Registered voters are more likely to engage in civic activities than those who have never registered. They are also more likely to talk to elected officials and be an advocate for themselves and their communities. Follow the instructions below and choose one of the ways you can register! You’ll need a Georgia driver’s license or state-issued ID card, with a signature on file with the GA Department of Driver Services (DDS) to register online. Register today by visiting the State of Georgia’s Online Voter Registration System! Be sure to bring your Georgia driver’s license or state-issued ID card with you when you visit. You can also return the form to any state or governmental office such as a public library, public school, county or municipal clerk’s office, and government revenue office. Nextdoor.com is a free and private social network just for your neighborhood. On Nextdoor, neighbors share crime and safety concerns, local events, recommendations, items for sale/free, ideas about how to make our neighborhood better, and more. 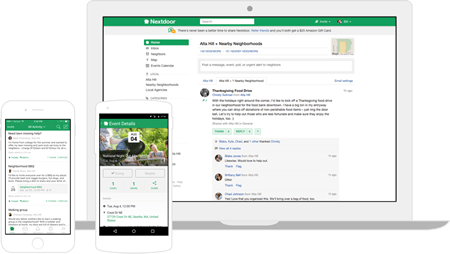 Try Nextdoor today and connect with your neighbors! Unfortunately, crime is a big motivation for folks to start engaging in their community. A good way to prevent crime and promote community involvement is to start a Neighborhood Watch program. These programs, which are sponsored by the DeKalb County, can give residents peace of mind and make them feel as if they are an important part of the community. 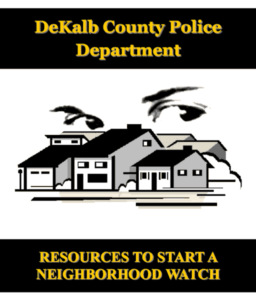 Step 1: Download the DeKalb County Neighborhood Watch Resource Guide (PDF) and assign block captains. Step 2: Complete the checklist and collect signatures of participation from your neighbors. Step 3: Contact the Public Education Specialist at your local police precinct. Precinct info can be found in the Resource Guide above.